You can store contacts in Thru to make it easier and faster to send new Thru emails. This is an address book of email addresses and email lists which can be used when emails are sent via Thru web portal only. 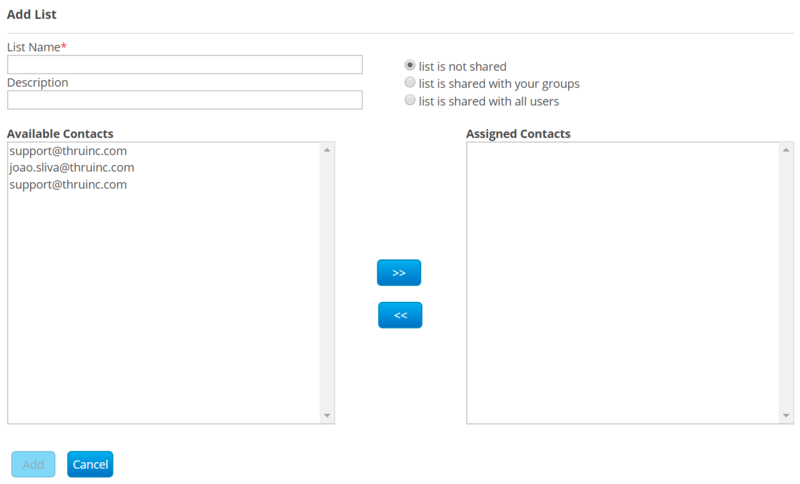 Each Thru user has own set of Contacts and Contact lists. 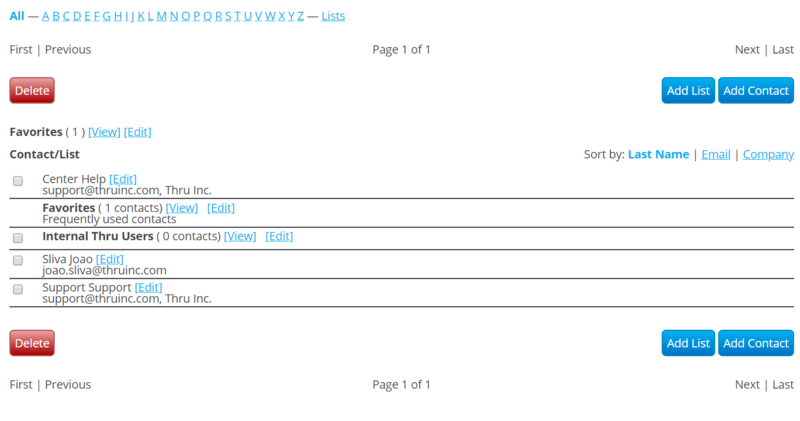 Note : In the Administration portal the Contacts section allows administrators to edit all Contacts of any Thru user. Contacts are not related to Thru users and cannot be included in Thru groups. Contacts can also be grouped into Contact lists, unrelated to Thru groups. Outlook contacts are available when using Thru Add-In for Microsoft Outlook. 1. Click on Add Contact. The Add Contact window displays. Fields indicated with a red asterisk (*) are required. 2. Type the contact information. 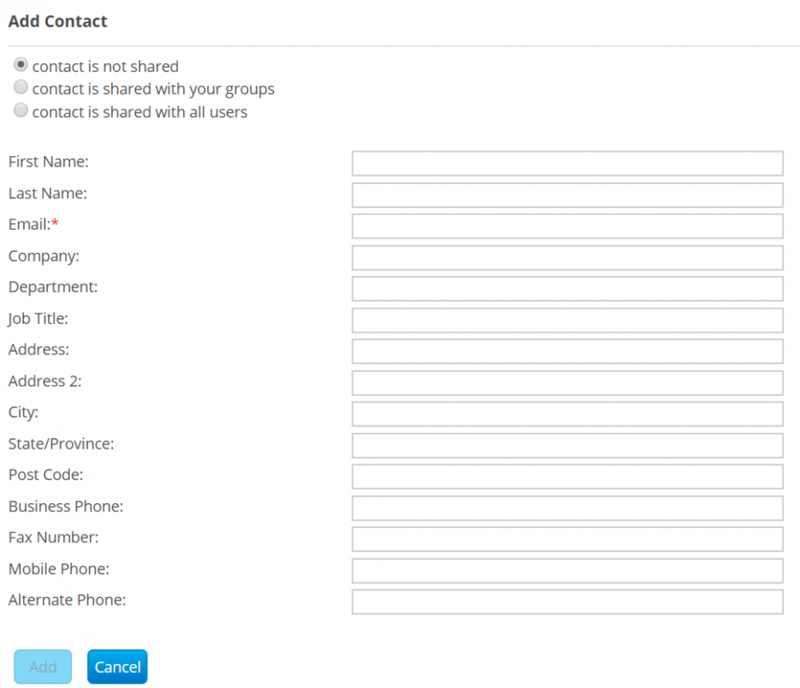 There are three bullets at the top of the form that gives the option to keep the need contact private, share with a user’s groups, or share with all users on the system. 3. Click Add to add the contact your contact list. Contact lists in Thru Web function like a standard distribution list used in email programs. You can add a new list if you wish to email multiple recipients at the same time. 1. Click Add List. The Add List window displays. 2. Type in the desired name for the list. 3. Type in the description (optional). “List is not shared” – You are the only one who will see this List in the Contacts folder. “List is shared with your group” – Only users that are classified in the same group as you will have access to this List. “List is shared with all users” – All users can see your List. 5. Select the contacts you wish to add to your Contact List and then click Add.